Hope all of you are having a great weekend and have joined my giveaway which ends tomorrow! 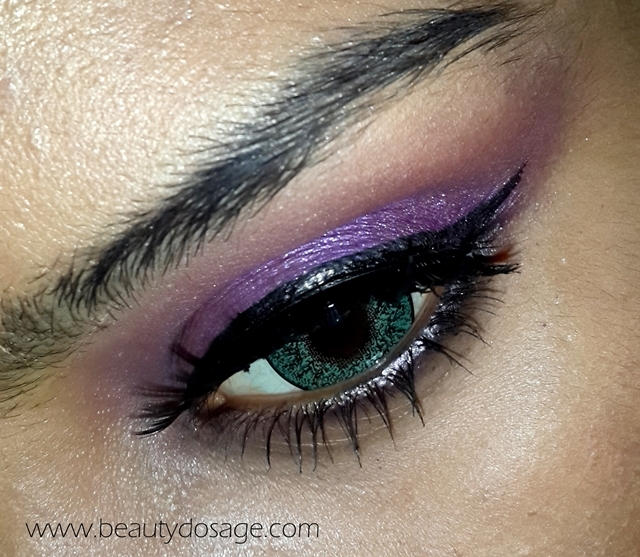 I recently received a couple more pairs of circle lenses so I was testing them in this post thus the green eyes :) I did a little bit of research and found that purple is a shade that compliments green eyes so this tutorial goes out to those lucky girls who are blessed with green eyes. Also not to mention purple also compliments brown/ hazel eyes! Lets get started with today’s tutorial! One the lids are primed, pick up a pink shade with a fluffy blending brush. Choose a vibrant purple shade and using a wet synthetic rush, apply it all over the lid area. Line 1/3 of the lower lash line with a black eye liner. Smudge the black liner with a small shadow brush or smudger brush. Don’t bring it down too far. Using a clean lending brush, lend the harsh edges from the purple with the pink we applied earlier. Draw a thin line on the upper lashline and flick it just a little it. Apply any false lashes you wish. wow. that's so beautiful. :) green and purple makes a great combination. Really nice colors, and easy makeup! Oh perfect for me, I got green eyes. Purple is a great color for green eyes.